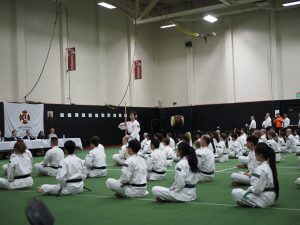 On June 8th & 9th, 2018, 106 kenshi coming from U.S. and Canada participated in the North American Shorinji Kempo Training Camp at the Astro Gym of Seattle University, Seattle, WA. The branches are: Ann Arbor, Asheville, BC Tozenji, Berkeley, Boston, Downtown New York, East Portland, Los Angeles, Monterey, Mt. Diablo, Northern Utah, Orange County, Peninsula, Portland, Quad Cities, Salem, San Francisco, Seattle, Seattle University, Silicon Valley, South Bay, South Florida, Vancouver, Vancouver Pacific, Yuma, and World Bank. 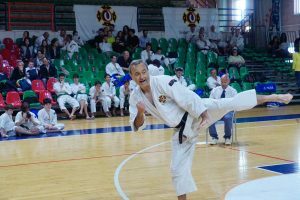 Mr. Kazuhiro Kawashima sensei, Secretary General of the World Shorinji Kempo Federation, was the main instructor. 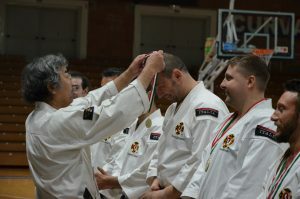 For 2 days, we practiced from 9 a.m. to 5 p.m. and enjoyed all practice together: Kihon, Hokei, Unyoho, and Embu. 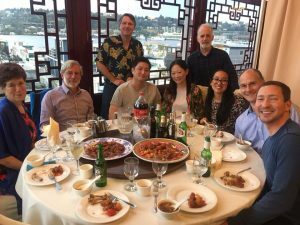 At the evening of June 9th, we had a dinner party at the Chinese Restaurant at the beautiful Seattle Harbor. We enjoyed having delicious meals and drinks as well as enjoying fun conversation together. 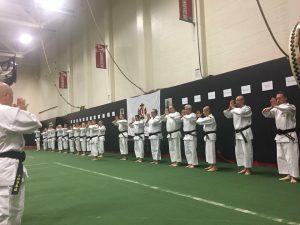 On June 10th (Sun), 2018, the 6th North American Shorinji Kempo Taikai was conducted with 152 kenshi attendees. 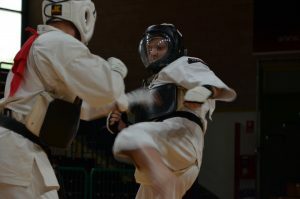 There were 2 categories: Competition & Exhibition Divisions. 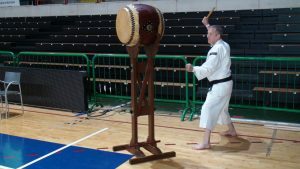 After the Taikai opened at 9 a.m., more than 100 audiences enjoyed watching and were very impressed with techniques with sharp movement and big Kiai. After every Embu or Unyoho was finished, the audiences gave big hands to kenshis. 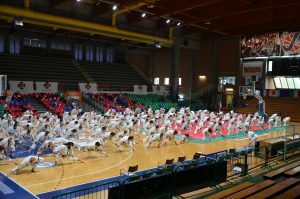 After the closing ceremony, all kenshi praised each other and promised to meet at the next Study Session and the Taikai next ear. 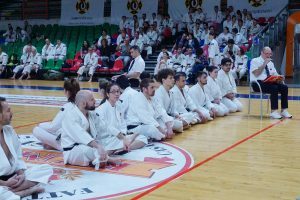 United States Shorinji Kempo Federation really appreciate all the participants’ precious time and passion to Shorinji Kempo! 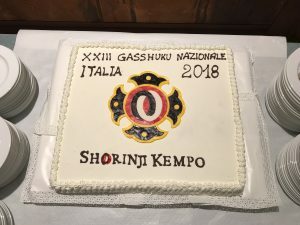 On 28 and 29 April 2018 was organized on XXIII Italian National Gasshuku “ITALIA 2018” at the Palazzetto dello Sport “PalaFerraris”, Casale Monferrato (AL). 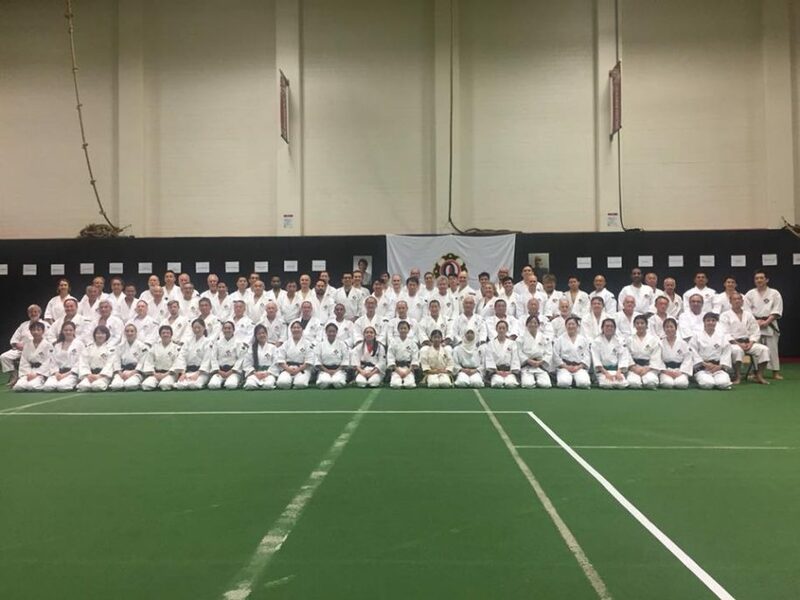 This event was attended by around 250 people, including Sensei and Kenshi, and friends from other parts of Europe (England, France, Germany, Sweden). 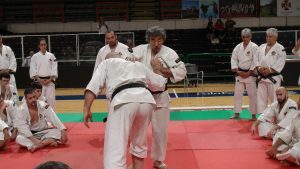 The inevitable presence of all Italian Branch Masters and especially the presence of Hiroshi Aosaka Sensei (9° Dan Daihanshi), from France, always regular guests of all our National events. 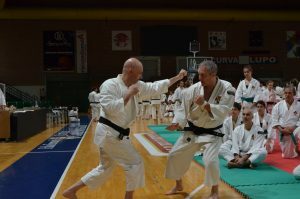 This event, being an official Seminar of SHORINJI KEMPO UNITY, in addition to practice, was also given a lot of importance to the philosophical part, personally supervised by Sensei Aosaka that we remember he is the Director of the WSKO European Office. 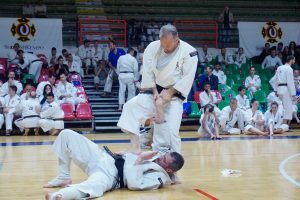 For the technical practice he was helped by Sensei Nobutaka Mukaida (7° Dan Seihanshi (President of Nara Prefecture – WSKO Instructor) and Sensei Mayumi Okuda (5° Dan Daikenshi (Vice President of Nara Prefecture). 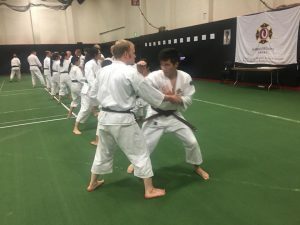 The workouts are started on April 28 afternoon with Chinkon-Gyo then, were performed Kihon and Hokei, alternately, by the various Branch Masters. 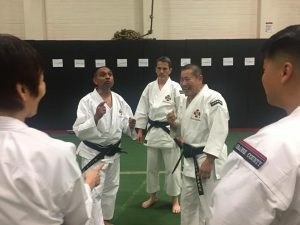 Then during the course of the morning there was divided by degrees where everyone has rehearsed its technical program, always under the supervision of Aosaka Sensei and Mukaida Sensei who alternated in and in-depth explanations of the various techniques. 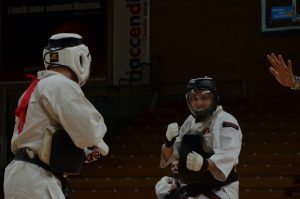 The next day, the workout restarted in the same way on Saturday, always alternating moments of Howa. 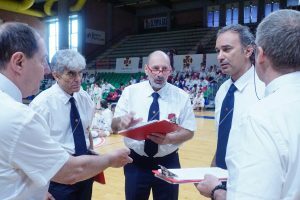 After the final greetings and gifts delivery, on the afternoon of Sunday 29, the works were completed. 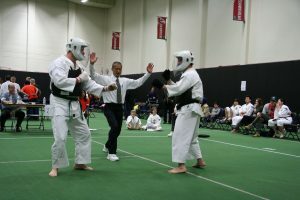 On April 28 morning, Taikai was held. 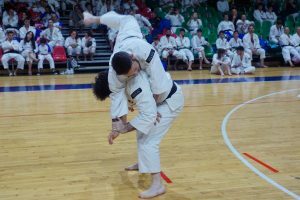 There were all the specialties and this year we introduced the randori / un’yoho. 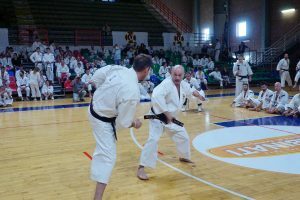 There were about 100 athletes from all over Italy involved in Kumi Embu competitions in pairs, Kumi Embu Tan-en and Randori. 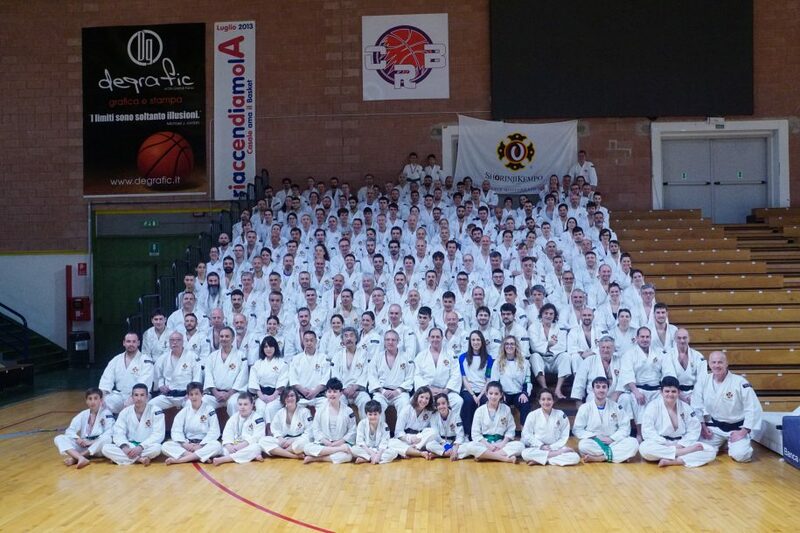 We thank all those who helped for the success of the event, all the teachers and athletes who have come from all over Italy with the hope to meet again in the next European Taikai in Sweden in July 2019. 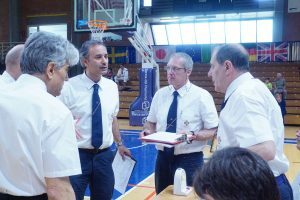 We were also pleased to host during the time of Solidarity to support the “Associazione Pulmino Amico Onlus” of Casale Monferrato that provides free transportation to patients through the work of professionals and volunteers carefully selected, trained and coordinated with the aim of providing the patient and the his family a human and psychological help.